The Vertigo is a common genetic hybrid of human and hunting spider. 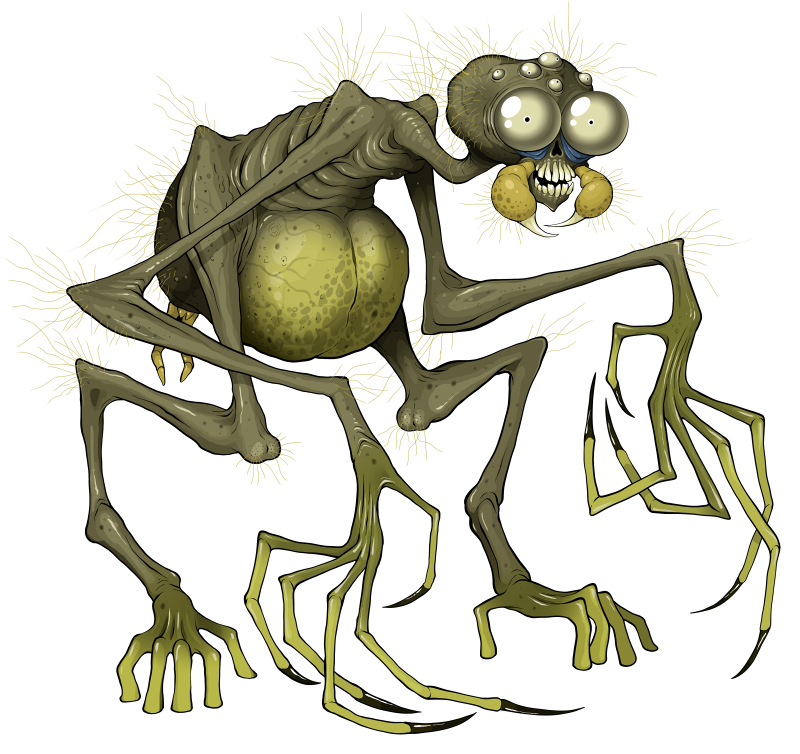 With the aid of its silk and the adhesive microfilaments lining its hands and feet, the light and nimble Vertigo can scale sheer surfaces and dangle from ceilings with ease as it pursues such prey as birds, bats and especially smaller monsters, with a notable appetite for Dipteran Arthropoids. Sticky, silken traps are often more than enough to incapacitate prey, but the monster may subdue more troublesome meals with its neurotoxic venom, known for causing a burst of energetic convulsions or "dancing" before the victim succumbs to a prolonged state of paralysis. With too narrow an esophagus for solid food, the Vertigo encases its prey in a thick cocoon of silk with a single, small opening through which it can regurgitate its viscous, green digestive fluids. A roughly human-sized corpse may yield a single meal's worth of liquefied tissues within only hours, and last several dozen meals over the course of months or years. A Vertigo may vary dramatically in size and coloration accordingly with its spider basis, and interbreeding results in a limitless variety of unique color morphs. Females are typically larger and more aggressive than males and especially defensive of their young. The typical Vertigo is a reclusive, cautious and courteous being. Unless ravenously hungry, it is easily convinced to release more intelligent prey items, and will under no circumstances resort to cannibalizing another Vertigo without its express consent, typically given when the latter party is elderly, mortally wounded or significantly bored. Females are generally more aggressive than males, especially in defense of their children, and may display extreme reluctance to allow even fully mature offspring to leave on their own. A single, unusual colony of Vertigo are a dramatic exception to their usually mild temperament. Characterized by bone-white heads on jet black bodies, this highly inbred population slaughters anything even slightly divergent from their own lineage and displays no capacity for verbal communication. 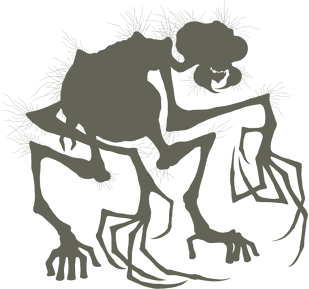 Inhabiting a network of tunnels beneath a desert valley on the outskirts of Mortasheen city, their presence is betrayed only by the steady vibration of their countless crawling bodies and the wafting stench of corpses piled high around their entry wells. Vertigo are common, popular Arthropoids for their agility, venom and easygoing nature alone, while their silk offers virtually endless uses. Many Vertigo become or are employed by clothing designers and other artists, while the sheer strength of the material makes exceptional protective gear. The thickness, elasticity and adhesiveness of the monster's silk are all finely under its control, and different qualities may be combined into a single complex rope ideal for hanging and swinging. SPIDER LEGS: Vertigo are adept climbers and can stick to most surfaces. VENOMOUS BITE: The Vertigo's bite causes a surge of energy, convulsions, and finally a paralytic state. SILK: The Vertigo can rapidly produce ropes or sheets of silk for a variety of purposes.